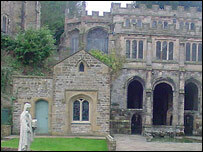 About 1,000 pilgrims are expected at a Christian shrine in north Wales which has been attracting visitors since the 7th Century. Last year, people from as far away as New Zealand came to St Winefride's Well in Holywell, which is said to have healing powers. The legend of the well tells how a local chieftain beheaded the maiden Winefride after she rejected him. A spring is then said to have risen from where her head fell. According to legend, where Winefride's head had fallen, "the stones surrounding the fountain were stained forever with her blood, and the blood falling in the water coloured also the moss that grows there and which has the perfume of frankincense, though some say of violets." St Winefride's is the only site which has remained an unbroken destination for pilgrims, with the others having been disturbed by Henry VIII. It is also said to be the finest example in Britain of a medieval holy well, and, of course, it gave the local town its name. Pilgrims will walk to the shrine from Wells Street on Sunday afternoon, followed by an open-air mass, and a benediction and veneration of a statue of St Winefride. 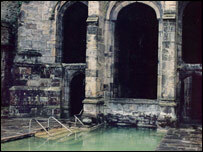 The well is regarded both as one of the seven wonders of Wales, and as the nation's equivalent of Lourdes. The well's biggest crisis was in 1917 when it ran dry. It was a result of tunnelling by a lead mining company which drained the water into the river Dee, but supplies were restored later that year when another underground stream was diverted.